myReviewer.com - Dogs and Cats Living Together... Mass Hysteria! Clash of the Twin Sky Dragons! The last couple of days have redrawn the anime map in the US and to a significant degree in the UK as well. For a long time, I and many other anime fans considered Funimation and Crunchyroll as mutually exclusive, if not openly antagonistic. When it came to streaming anime, the two companies were in direct competition, bidding for the choice picks each season, and the biggest annoyance anime fans had was that they had to buy two subscriptions to stream anime each year. To a lesser degree, this affected physical releases as well. Crunchyroll get a lot of streaming licenses, but they do also have a few home distribution licenses as well, and they tended to use the Diskotek company in the US to author and distribute their titles. The most obvious clash came over Free! for which Crunchyroll had the home video license to Season 1, and released it DVD only, while Funimation got Season 2, and released it on Blu-ray. All of that is now a thing of the past, as Funimation, and Crunchyroll are now partners. Given the state of anime licensing, which is rapidly approaching, if not passing the insane prices of the last bubble, this is a wholly understandable move. What this means for customers in the US, Canada, and the UK especially is that online streaming is going to get a lot simpler. Crunchyroll will now host Funimation’s streaming catalogue in subtitle form on their site, alongside their existing catalogue and continuing new licenses. If you’re a dub fan on the other hand, Funimation Now is the place to be, as this will hold Funimation’s broadcast dub simulcasts, the dubbed back catalogue, and the odd title from Crunchyroll which has been dubbed in the past, and those that will be dubbed in the future (Season 1 of Free! is an immediate example). Of course the existing limitations on what shows are licensed for UK streaming still apply (we don’t get Cowboy Bebop for example). In terms of physical distribution, this applies only to the US for now, but as usual physical releases do trickle down to the UK eventually; Crunchyroll will now be using Funimation to distribute those titles for which it has home distribution licences. You can read more detail in their respective press releases. SAN FRANCISCO and FLOWER MOUND, Texas — September 8, 2016 — Crunchyroll and Funimation, the two leading global providers of anime, have announced a partnership to improve the fan experience and grow the current reach of anime by sharing titles across streaming, home video, and electronic sell-through (EST). Through this agreement, Crunchyroll will continue creating the best subtitled streaming experience for fans, while Funimation will focus on delivering the best in English-language dubbed (“Broadcast Dubs”) streaming. This collaboration will enable fans to enjoy more anime in more ways than ever before. Starting today, Crunchyroll viewers will have access to subtitled versions of Funimation’s summer simulcast titles, including D.Gray-man HALLOW, FIRST LOVE MONSTER and Puzzle & Dragons X. And in the weeks to come, FunimationNow viewers will be able to watch Broadcast Dubs of Crunchyroll’s summer titles, including 91 Days, Mob Psycho 100 and Orange, with release schedules to be announced. Both companies will also work together to bring the best in subtitled and Broadcast Dubs titles for future seasons to come. When we started Crunchyroll, we wanted to bring more anime to fans around the world. With the ongoing support of fans (like you) and creators, we have been fortunate to, slowly but surely, increase access to anime for a growing and dedicated fanbase. Now, we take another big step towards realizing our founding goal. 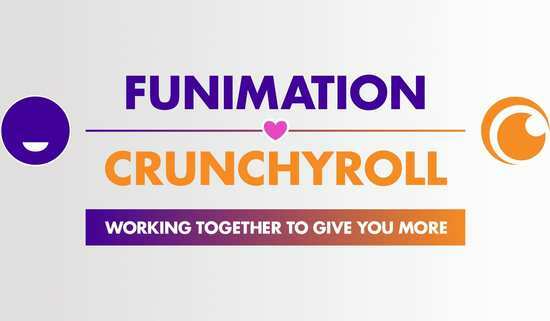 Today, Funimation joins Crunchyroll in our common mission of bringing more anime to fans and more fans to anime. We are announcing a partnership that will expand the anime lineup on both services as well as provide more ways for anime fans to stream, purchase, download, and access more of the shows they love. Crunchyroll viewers now have access to subtitled Funimation simulcasts, starting with summer titles D.Gray-man HALLOW, Puzzle & Dragons X, and FIRST LOVE MONSTER. Going forward, Funimation will be distributing even more of their simulcast titles on Crunchyroll. With this partnership, Funimation will also be contributing their subtitled catalog to Crunchyroll. This includes some of the most critically acclaimed and popular titles of the past two decades. You can start watching PSYCHO-PASS, Cowboy Bebop (one of my favorite titles of all time! ), and Grimgar of Fantasy and Ash today. We will continue to add more and more catalog titles over the coming weeks and months… there’s a lot of onboarding, encoding and processing taking place behind the scenes! The partnership extends to Crunchyroll titles as well. Later this fall, you will be able to access several of our titles, such as 91 Days, Mob Psycho 100, and Orange, with English-language Broadcast Dubs on FunimationNow. We will be announcing more Broadcast Dub and dubbed catalog titles in the coming weeks which will be available on the FunimationNow service. We are all really excited to be working together to bring you the best possible anime experience. As always, we would not be where we are without your continued support… and as always, thank you for watching -_-.